In an Arizona manufactured home, maximizing the available space is key. By revamping your storage and organization techniques, your AZ manufactured home will feel less cluttered in no time! Read our tips on organizing and removing the clutter from your home. 1. Identify the trouble spots. Walk around your home look for places where you find clutter, and make a list. Do you have an unorganized desk or bookcase? Organization begins with identifying trouble spots throughout your home. 2. Throw it away. Focusing on one place in your manufactured home at a time, sort through items and identify what can be thrown away or donated to charity. Ask yourself which things you really need. If you haven’t used an item in the past six months, it is probably safe to throw it away. 3. Sort what’s left. After you decide what you are keeping, begin to sort the items into logical piles. It’s best to store items together that are often used together. For example, keeping gift-wrapping supplies all in one place and keeping scrap-booking supplies in another will help items be found quickly. Try to keep things in logical places as well – cook books may be better kept in the kitchen than the office! 4. Box it, hang it, arrange it. You may need to purchase or find a few new organizing bins or boxes to fully maximize that space in your AZ manufactured home. 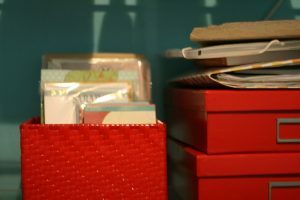 While shopping for stylish organizing items can be fun- you can also organize things throughout your home in shoe boxes or other organization tools you may already have. Browse the internet or magazines for creative ways to organize specific parts of your home. Organize your whole home at once may be a big undertaking! To keep your Arizona manufactured home organized, take time each month and organize one room or part of your home until the entire house is free of clutter.